Q. What are the key differences between Part 1 and Part 2? Radcliffe: The first part is kind of like a strange sort of road movie in a way. First of all, people will be seeing the kids outside of Hogwarts for the first time, which is a big deal. The first film is about the gathering of information and all the things we need to go toward the final battle. The second film essentially is the final battle from start to finish. Actually, no, we don't know where it starts because it keeps on changing. Q. The first six films, as far as adaptations of the books, were a study in sacrifices. Do you believe the final films will be faithful to the book? Radcliffe: We'll have to sacrifice some stuff. The things we have sacrificed are subplots, but in this, there really are no subplots. They're [as] important as the main plot. That was the reason we knew we had to do it in two. Q. 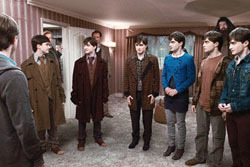 How daunting was it to film the seven Potters scene? Radcliffe: A lot of it's more painstakingly slow than complex. We filmed it each time in seven different places. At the end of the day, we were then shown a very primitive version of what it was going to look like eventually. After 95 takes, it was the most gratifying thing to see how good it looks. It'll be very obvious which one is Mundungus. I was just delighted at how good I looked in [Fleur's] costume! It looked like a David Bowie outfit. Q. Is there anything you want to take as a keepsake? Radcliffe: The glasses. And hopefully, the lens-less ones because those are the ones I wore most. I liked the pair from the first film as well. Even the wand is not such a big deal to me. 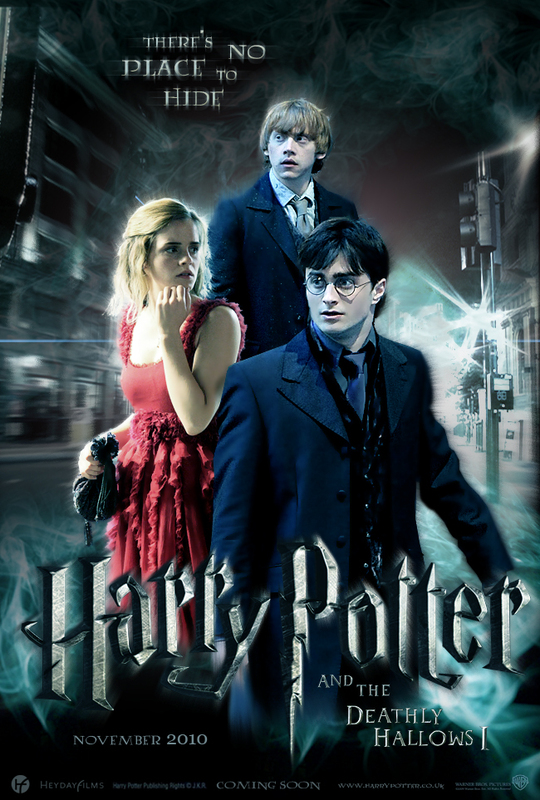 The wand was different in the first two films, so even that hasn't been a constant through all seven. Q. What will you miss when this is finished? Radcliffe: I'll miss the crew and the sense of family that we have here. It's something very hard to recreate. There are people here who I've known for 10 years. It'll be a moving, emotional day saying goodbye to a lot of people, but it'll be exciting going into other things. To read the rest of the interview, check out Fandango! And for a really long Behind-the-Scenes look at the movie, with lots info on what going to be in, and what's left out, check out this post! I was really excited to find out that Bill and Fleur's wedding is going to be IN and that they've added a Harry/Ginny dancing scene! YAY! Hopefully it will be a lot less cheesy than the scenes they had in HBP. The closer this movie gets, the more excited I am! I just can't wait!